Hippocrates, regarded as the father of medicine, claimed that “All disease begins in the gut”. Over 2000 years later, many experts in the field of nutrition would agree that a person’s overall health is largely a reflection of what is gong on in his/her gut. The “gut microbiome” – the makeup and balance of microorganisms in the stomach (i.e. Bacteria, Fungi, etc) – is the subject of many incredible contemporary clinical studies and is quite an emerging scientific field. Personally, I am a big fan of probiotics to help maintain a healthy gut flora. Speaking from my own experience, I have found that flooding my stomach with “beneficial microorganisms” (i.e. good bacteria) has had a profoundly positive impact on my digestive and immune system health. Several years ago, I began drinking GoodBelly, a 2.7oz “shot” of fruit flavored non-dairy probiotic supplement, that is readily available at health food stores, such as Whole Foods Market. I noticed a slight, yet inconsistent, benefit in drinking the product. I later moved on to KeVita, which is a widely available 15.2oz sparkling flavored probiotic beverage, almost like a probiotic soda. I liked this better, but I still was not seeing a consistent benefit. I finally got the courage to begin drinking kombucha, which is a flavored, fermented and naturally carbonated probiotic tea. Kombucha is described by some as the “elixir of life”. According to my research, the first recorded use of kombucha comes from China in 221 BC during the Tsin Dynasty and it was known as “The Tea of Immortality”. I had long been told that kombucha tea was an acquired taste. I would have to agree with this advice, as the first one I ever tried (GT’S Original) smelled like sweaty socks and tasted sour as hell. As I began experimenting with the various flavors of GT’S, of which there are many, I developed a preference for their Gingerade product. I began drinking it consistently, enjoying the great benefits and craving it almost daily. I tried some other brands – even some that are available on tap only at health food stores and restaurants (i.e. Whalebird) – but I determined that, as far as bottled brands go, I was to be a GT’S enthusiast. This is only the beginning of the story…. 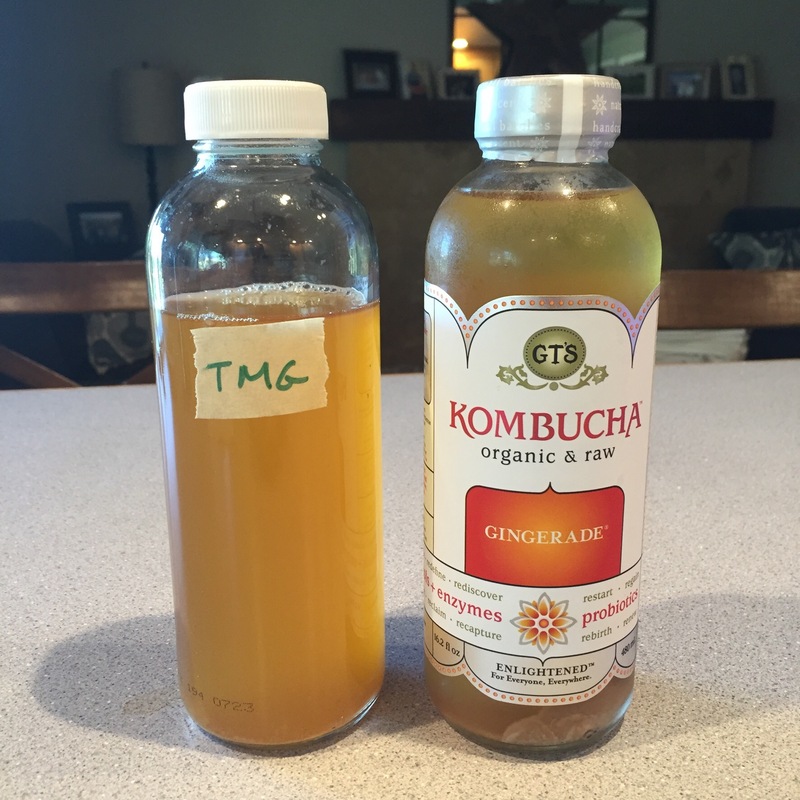 Despite loving my new kombucha tea habit, and realizing the many great benefits, it was becoming DAMN EXPENSIVE. 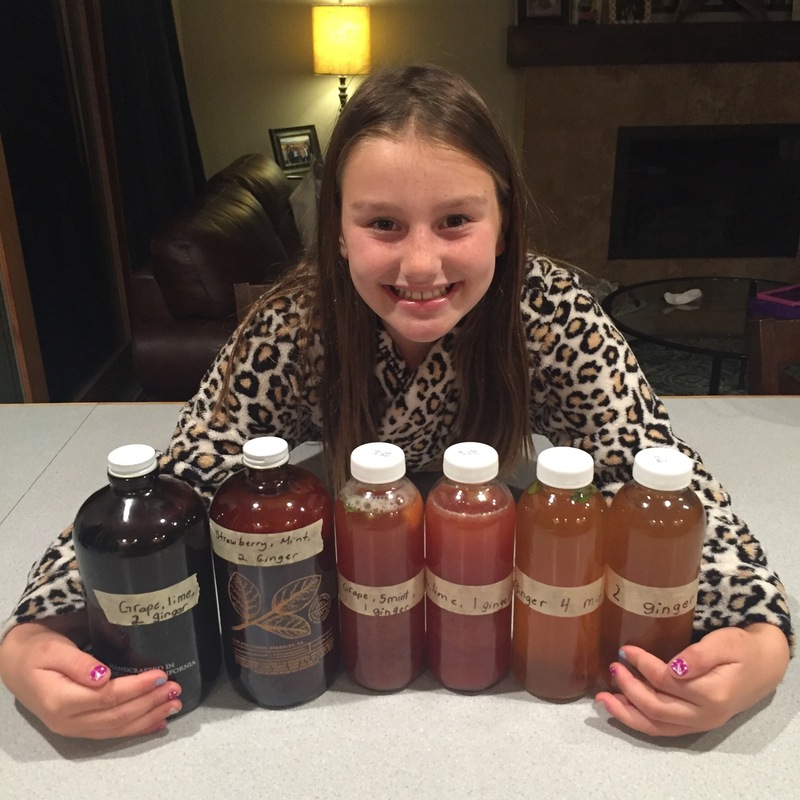 Each bottle of 16oz GT’S kombucha retails for up to $4.00!! In other words, if I kept up this habit, I would be forking out well over $1000 per year….that is one expensive probiotic! It was after this realization that I decided to take matters into my own hands and begin brewing my own kombucha tea at home. 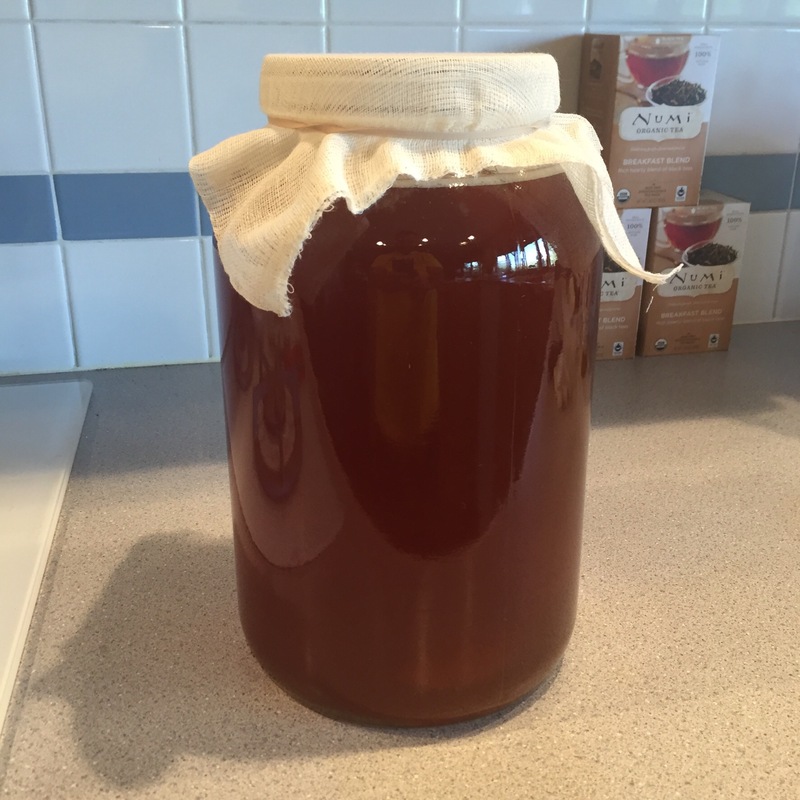 There are many websites, social media platforms and YouTube videos dedicated to the craft of home brewing kombucha tea. After watching many tutorials and reading/studying about the do’s and don’ts, I decided to take the plunge with my 9yo daughter. 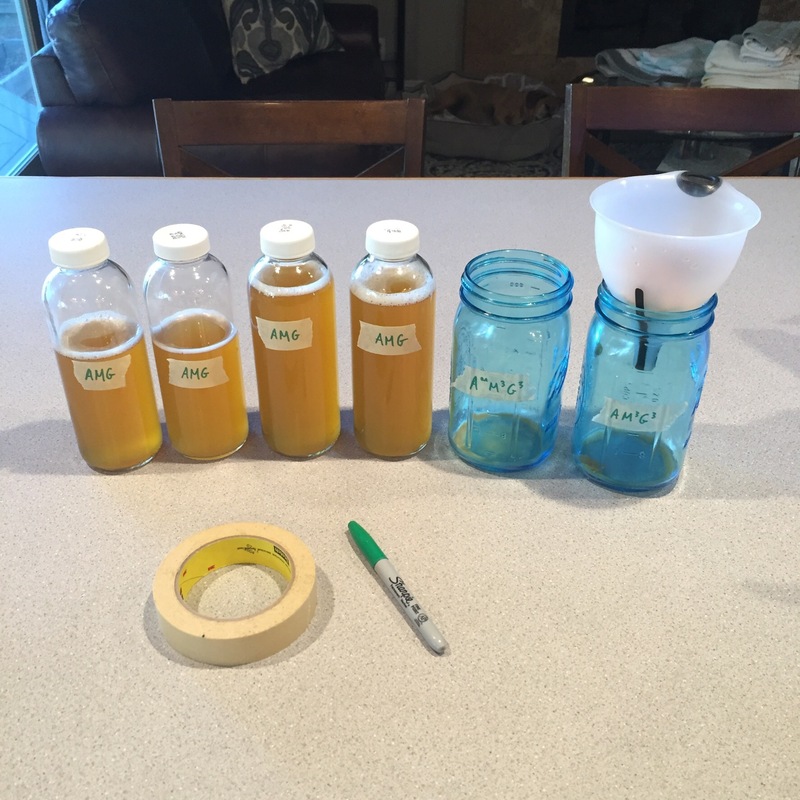 One month in, and a few batches under our belt, we have yet to become masters of brewing kombucha tea….but we are having a lot of fun in the process! 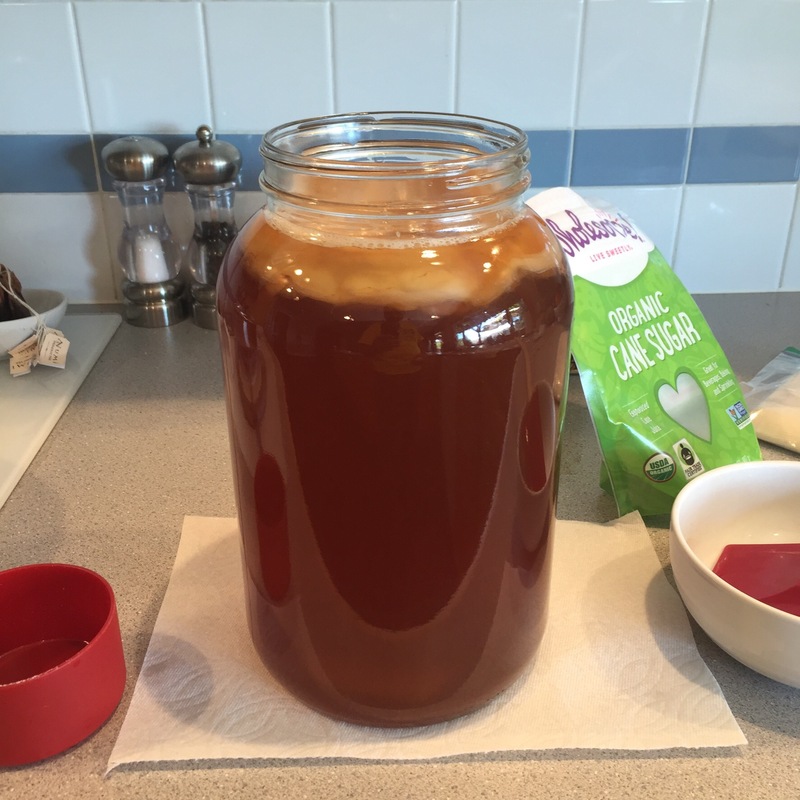 Following are some photos documenting our kombucha tea adventures. Please feel free to reach out with any questions you may have regarding the process. Enjoy! 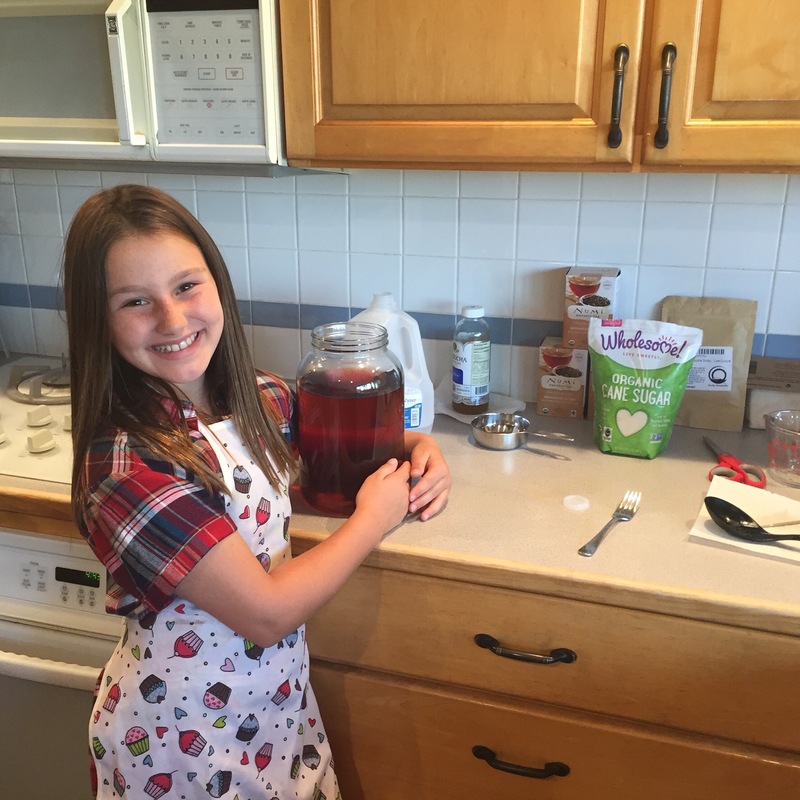 Charlotte giving our first batch of sweet tea some love. Ready for the first fermentation of our first batch. 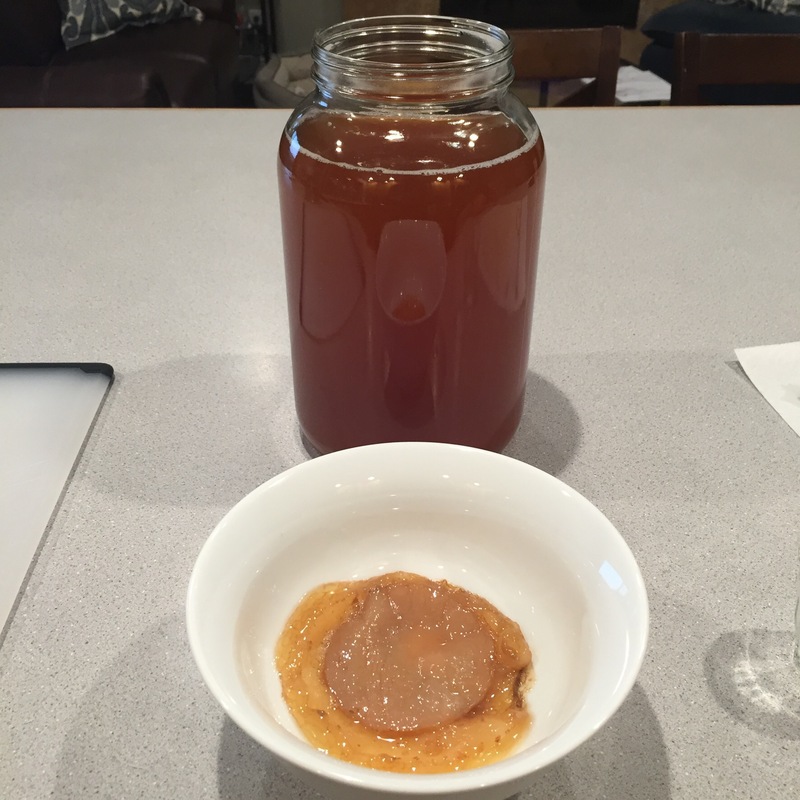 The mother SCOBY (small) attached to the baby SCOBY (large), which formed in a week’s time. 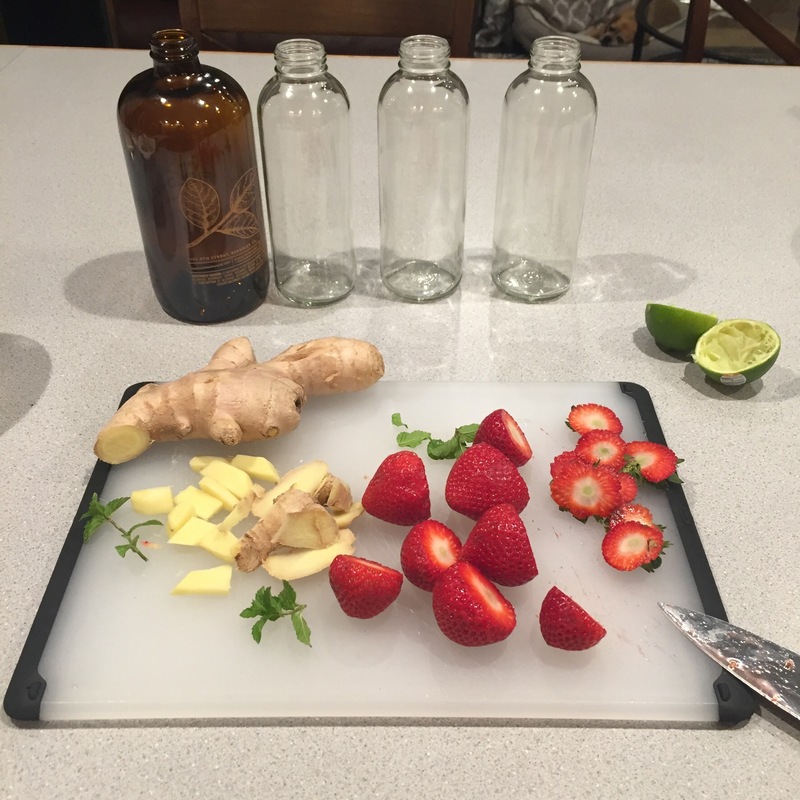 Creating a variety of flavors with strawberry, mint, lime , ginger and more. Charlotte showcasing our first bottled batch. 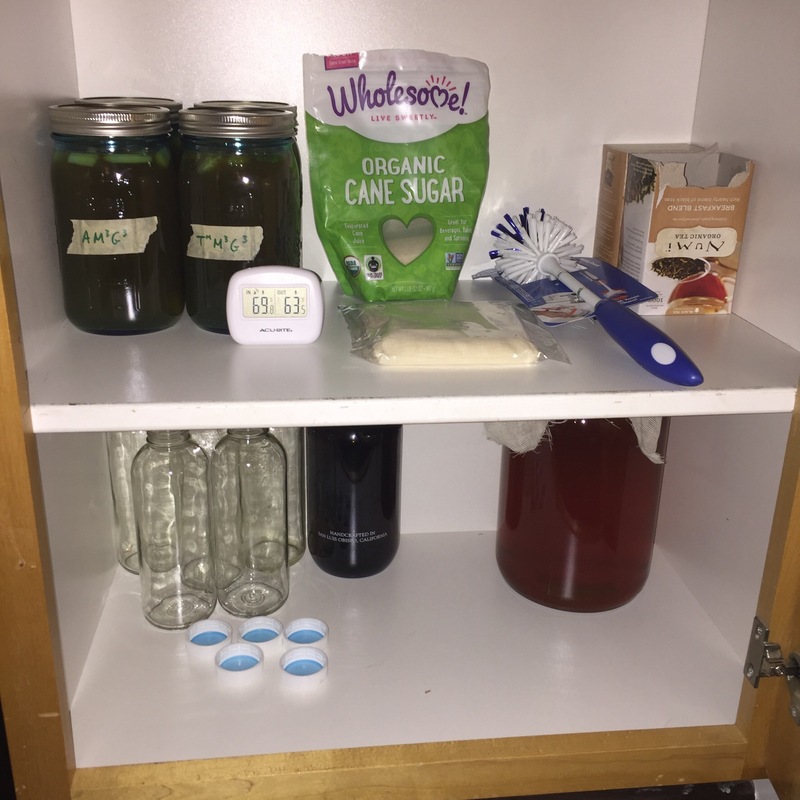 Our second and third batches in the newly dedicated Kombucha cupboard. Protege and master, side by side. Next step is to make fancier labels, LOL. 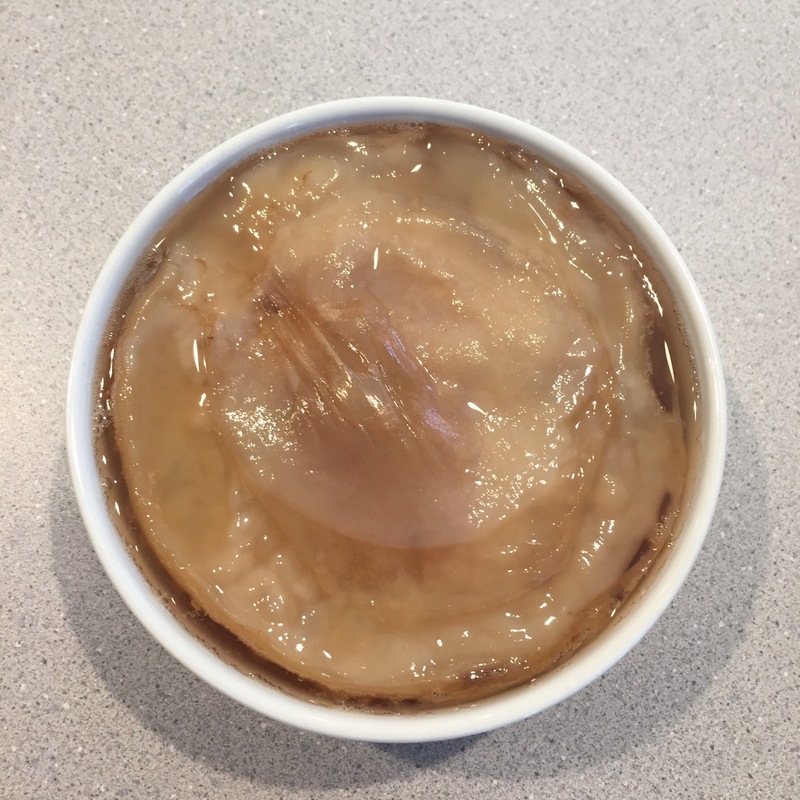 Our SCOBY (Symbiotic Colony Of Bacteria & Yeast) is all grown up! The next batch is up! It is a continuous practice of trying to perfect our recipe.